There are two mandatory entries in order to unlock the other entries in the Rafflecopter widget. They are pretty simple, Like us on Facebook so you can stay up to date on our products, and leave a blog post so that if you win I know what to put on your socks. Pretty simple! You do not have to do them both to be entered into the giveaway. You can do just one and have only one entry into the giveaway but you MUST do BOTH to access the remaining entry options. If you say you've done an entry that you haven't done it will be deleted. I've been running giveaways on my review website for the better part of 7 years. I run fair giveaways. Please be fair to yourself and others who are entering. Thank you everyone for your understanding. Good luck! I LOVE your socks. If I win I would love the " bring me wine" socks. They would make a great Christmas present. They are one of the most popular pairs. Everyone is loving them :) Good luck. I'd like a pair of "bring me a coffee" socks. Were you referring to a Singapore sling? I'd love for mine to say "If you can read this, bring me my wine!" I love these socks and would need the ones that say bring me a coffee!! 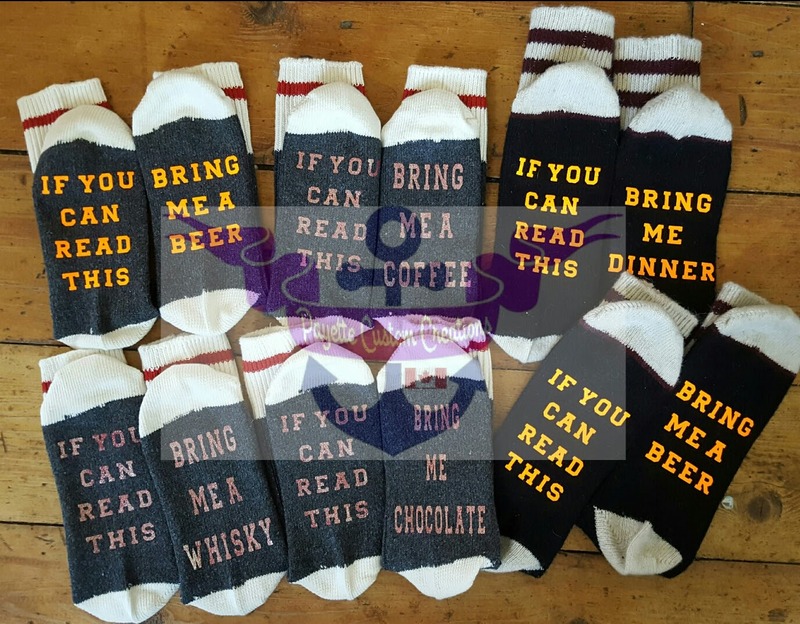 Coffee socks seem to be popular in this giveaway. I would love a pair that says bring me coffee. It would make a great Christmas gift for Kenzie! I would like either Coffee or Chocolate. Two of my favourite things. Love your socks..they are amazing!!!!! I would love a pair that says bring me an earl grey!! Can I bring you a Singapore sling?! Earl Grey... hmmm. I've made Tea ones but never that specific. And you most definitely can Brittainie :) So kind of you to offer! Thanks Pam. These are great for stocking stuffers and gifts for Christmas. I have sold so many to people for their in-laws :) But they are so comfy. I just love them. Thanks for sharing on Facebook. I appreciate it. Bring me a Beer, I know just the person to give them too for Christmas. I like em all but would choose "bring me a whiskey"
I have a pair that says that... I like your choice. I'd like a pair of "bring me a coffee" socks. These socks are awesome! I would definitely choose the "bring me wine" option! You're most welcome. Thank you for the complement :-) good luck with the giveaway. Mine would have to say bring me chocolate! Hard but will go with 'Bring me Wine"
Definitely a good pair of socks :) Good luck. Oh my, That's definitely a request I haven't had before... Now I want to make it to see if it would fit haha. Good luck with the giveaway. I LOVE the ones that say bring me coffee!! I am a coffee addict and this is so me!! Very popular pick for this giveaway, I'm quite surprised actually. haha. Good luck Melissa. Since they don't have "bring me caviar" as an option, I'll take "dinner" because i'm a horrible cook! For me it is a toss up for two socks, either bring me dinner or bring me chocolate! Great picks Lori. Good luck. I'm glad you like your socks, I also love mine. Bring me wine. Awesome socks. Thank you Florence, Good luck with the giveaway. I'd stick with the Bring Me a Drink socks. I could put them on after a rough work day and my husband and daughter would get the picture. Bring me a drink and no one gets hurt. That's awesome. I may have to add that to the line up. Good luck. That's a great idea. I could really use that pair. Love the beer socks, I need a pair that says Bring me Coffee! Hahaha I love this one!! Oh my gosh that's great! If you can read this bring me my cauldron . Haha. That's great! Good luck. They make great gifts. I bet he'd like them :) Good luck. "If you can read this, bring me my chocolate!!!" I would love the Coffee socks. They are popular. At first it was all about the wine socks but now morning drinkers are ordering hehe :) Good luck Heather. Hahaha. I like the second one. Good luck Chantale. I'd go for the Bring me Chocolate one. I would love If you can read this bring me beer. I am due in February and these would be perfect to wear for my first beer! Congratulations and good luck, with the baby and the giveaway. My birthday is in February and so is my middle daughter's. Maybe your baby will share with us. Although there are 26 other days they could be born too. hehe. Good luck Kimm. would love mine to say if you can read this then bring me some chocolate and wine! I want them to say I'm an interesting guy looking for an interesting woman. "If you can read this, bring me my coffee!" Mine would say bring me good luck. I can use it in my sweeps and in life. I would love the If you can read this....bring me a coffee! I would definitely choose the coffee ones. Great fun! Would love mine to say " if you can read this then bring me Beer"